Water temperature 63F no wonder those kitties are going ballistic! I spent a couple of hours on the Red last evening and was totally amazed by the aggressive nature in which the cats were feeding! I mean they were literally spanking the fresh cuts of goldeye we were throwing at them. In just under 2 1/2 hours we caught and released a wack of "BIG" kitties only two were under twenty pounds! To date the 2004 season has to be considered the absolute best on record.......I can't wait to see what September has in store! Hoo-Ya...Kinda Cool out Eh...but the good deal is... the fish'n is heating up quickly. Ya know, I dream about falls like this one is shaping up to be. If the trend continues...Ohh-Weee...this could be a fall to remember. Early cooling temps and a L-O-N-G cool Fall weather pattern to stimulate them hungry fish, these conditions often spells out the fishing years to remember. Yup..it is kinda early to say that is indeed the deal, yet looking back at the season in a nutshell, I would bet a cool fall will be the deal in 2004. Why do I drool when I see this early cooling pattern setting up? 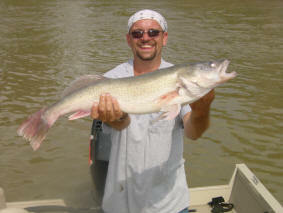 Well fish on average put on their greatest weight gains in the fall, and they do that by feeding big, well, and often. If they be a feeding, then they be a better target then average target to shoot for. If the forage base is good they will quickly target it and chow down heavy tell the ice sets in for good. After a brief slowing at early ice they tend to go right back on the chow wagon. Fall and early winter often produces the best trophy fishing of the season for species such as walleye, catfish and muskie. Sure...some folks are whining about the early cool temps...Baaaa....not me. I say Bring it on...I got wool socks...I'll be just fine. Some falls are more Golden then others, this may be a Golden Season in the making. I have a hunch I will be smiling wide at the rivers side, be it day and night this fall season. Fishing for cats on the Red in North Dakota continues to be very good. The Drayton dam is the hotspot for big cats right now. The fish are biting earlier in the morning and later in the afternoon. Many cats above 20 lbs. are being caught, with many in the upper teens. Cut suckers, frogs and golden eyes are the prefered bait. Two of us caught a 20+, two 19s and many from 15 to 19 lbs. in a few hours last Friday afternoon. Saturday was slow until later in the afternoon when results were again similar. Near Grand Forks, the fishing is good as well. Expect to catch one in the mid teens each time out........Two of us caught two 16s last Sunday. Fish above holes or above downed trees. Give the catfish up to 1/2 hour to smell the bait, if no bites, move to a new spot. Use your depthfinder to find holes holding fish. See a hole with fish in it, anchor above the hole........you'll catch fish. Same with downed trees. Anchor above them, wait for the big cats to come out after smelling your bait and you'll catch some nice cats. Downed trees in areas of deeper water are preferred. Cut suckers and goldeneye are working well. Frogs, if you can find them is working well too. Don't get stuck on one spot for too long...move frequently and you'll get some big fellas!! Once again the sauger run is underway here on the Lower Red and there's also some 'eyes being caught as well. In fact Backwater Eddy had some interesting results last Friday while cork'n for kitties off the rock's on the east side. He decided to throw a few Salmo's at 'em to see whether or not they'd cooperate. They did; not only did he have success by catching a few "big" kitties on the artificials he also caught three walleye, the largest going 27-1/2 inches! Getting back to the sauger action, those fishing directly below the dam are catching high volumes with the occasional walleye thrown into the equation. With the ever so slight increase in flows this year the forecast looks very promissing for a strong showing of trophy 'eyes begining next month! Only time will time so we will have to sit back and be patient for another 4-5 weeks before the fall run begins. With the past three dismal falls behind us we're due for a bumper crop! Cats should be ballistic come September as well, then again we expect nothing less of them do we! In the 1999 tournament(at 11amSat)I did the same thing!About 430pm(on stage)it was 29inch,9.88lbs.I never regret mounting that RedRiver trophy.Yours looks awsome too! The more I see that Fish the bigger it keeps getting. I just can't wait to get down to that stump and catch me one of those marble eyes also. Great Fish there. The 9lb 8oz walleye I caught, on cutbait, while fishing for CATFISH! This stupid fish would have put us into the top 35...any other day and I would have done back flips. So let's hear it guys....who won, got 2nd, 3rd, etc... with how many pounds....was the fishing great, good, bad??? Details, Details!! Those of us who couldn't make it and live too far away to hear it through the grapevine are dying to know!!! I hope everyone had a great time!!! Wish I could have been there!!!! Scoot can you beleive it, I didn't fish in it this year. Used most of my savings getting everything lined up for my guiding service. Kolby wasn't to sad about it but being down there during it sure made me miss it. Congrats to Jason D. and Scott. M & Brad D and there partners great job guys. Good luck on the Cats Inc event. I wish all participants a safe and fun weekend. Catch a Sumo piggy for me too while your at it Eh! Backwater Guiding "ED on the RED"